I was a little taken aback, because Corey’s blueprint of his dream bedroom was beautiful! It had all the right things, and was designed with all kinds of creativity. Miraculously it was to scale (many third graders struggle with this a bit!) and it was a totally perfect birds eye view. So I sat him down at my table where four other students were sitting. Corey was fighting back tears as we went through the specifications sheet. 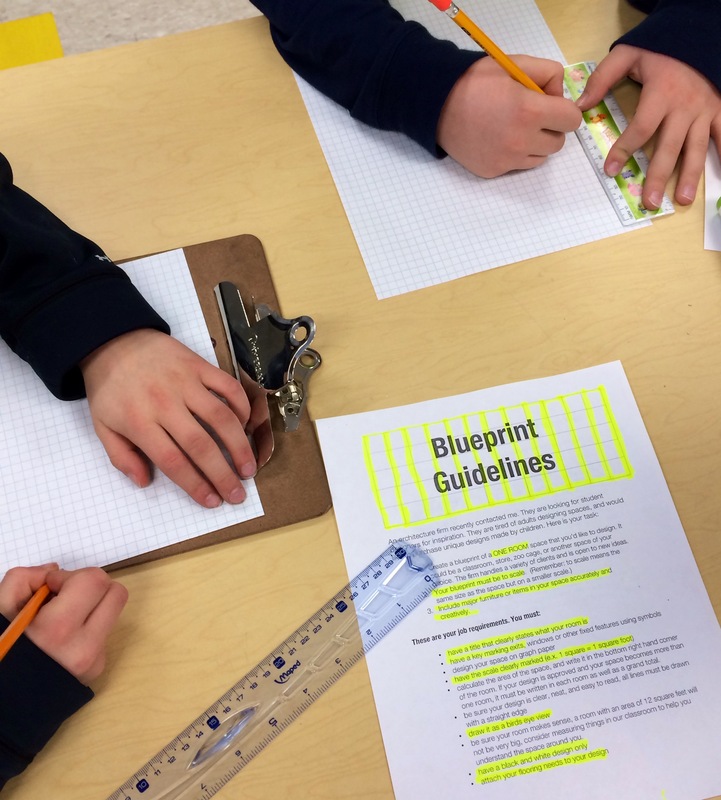 As we named each specification the other four students at the table gave him encouragement, pointing to each item on his blueprint as I read it off. When we got to the part where it said to calculate the area of the space, that was when he really broke down in tears. Now I know I should never underestimate the power of anchor charts, because at that moment, one of the other boys at the table looked at him and said, “Look up on the Smartboard!” We had worked through calculating area in three ways just a few days prior, so I’ve kept this slide up every time we worked on the project. Then, he proceeded to help Corey figure out which way would be the best way to calculate the area of the space. The student who was helping used a calm voice, and his method was methodical. Once Corey had the help, the tears went away and he handed me his final page with a very proud smile. I learned today that a kind classroom community will support all learners. Students can stay calm in the face of obstacles if those around them are calm and supportive! I think sometimes I feel like I have to be the one to help them, but their peers can be just as helpful if not more so. As I reflected on my day today, I want to think more about how to foster that type of community so that everyone can learn to persevere together. One of the best pieces of advice I ever got from a fellow colleague was a surprising one. It happened while I was student teaching, and while I was walking around conferring with students. It looked like I had an actual tail made of third graders. I was like a giant third grader magnet. These little tiny children were up out of their seats, following me all over the room. Now I am not a “sit at your desk and don’t move a muscle” type of teacher, I get that kids have to move, but this was impossible to manage. My cooperating teacher sat me down after school and said, “Tell them to stay put, and you’ll be right there.” I have to admit that in my head at the time I was thinking, but they need help! They need my help! I must have done a terrible job teaching the lesson and I must deserve this never ending trail of questions and interruptions! She explained that the moment they get up and follow you, they’ve stopped working and thinking. If they stay at their desk they may actually be able to work through some of the problem. Then, they know that they can catch you as you walk by. Her words also made me realize that this system is more fair to those students who would never in a million years get up and ask you for help. It evens out the teacher time as you confer and work and think with your students. So new teachers, the next time you’ve got a trail of students swarming you, tell them to stay put and you’ll be right there! I am so thrilled to be guest posting today over at Minds in Bloom, Rachel Lynette’s awesome blog! In the post I talk about how I noticed a misconception that my students had about the equal sign. I decided to use candy to help my students understand what the equal sign *really* means. I am going to preface this post with a note about me. I am not at all a person who self promotes or constantly mentions things I’ve created in blog posts to sell them to everyone. I don’t use cutesy clip art or decorative borders. My cover pages for the things I create are always pretty straightforward with real photos of students doing real math. The units I write are meant to take students to a deep level of understanding, with research based practices. In addition, I want this blog to be all about teaching tips, reflections on the best ways for our brains to learn math…not a non-stop promotion of myself. The whole idea of putting items up for sale took me a full year to actually agree to do, and only because the staff members in my building kept on pressing and encouraging me to share to the world what I had created for all of them. My hopes and dreams are to raise enough money that I can design an online math fact fluency program that is all in my head and just waiting to happen. With all that being said, I did join an event called a Facebook free-for-all. I joined because there are people out there that are just like me, they want their ideas spread because our primary focus is not about making money. We know that the more we share, the more we’ll learn about becoming better for our students. I have been going through the “map” and am amazed at all of the things that other teachers have created and are giving away for free. It’s truly remarkable. It will take you to my free resource, Elementary Architects. The reason I linked this to my facebook page, is because there is a map that you can use to find other people who are participating in this same event (you’ll see on the picture it says “click here to find more”. If you don’t have facebook, hate facebook or really hate the whole idea, you can still get Elementary Architects for free in my TPT store. It’ll be free until January 27th! In Elementary Architects, students design a space, calculate the area of that space and then figure out the cost of flooring. It is sort of cool because it differentiates naturally, and it requires LOTS of precision. I pay my students with classroom dollars if they get everything perfect on the specification sheet which is very motivating to them. Here they are at work! What I like best about this project, is the structured days leading up to the actual work that they do. 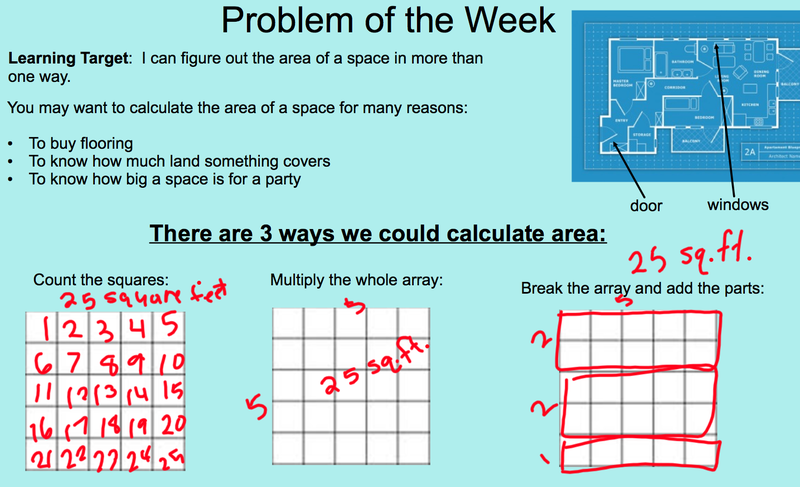 They learn little bits at a time, and I can even introduce the distributive property as a third way to calculate area. I hope you find it useful, and would appreciate any feedback you can give to help me get better! Five year old math is SUCH fun math. My daughter and I have been doing our 20 minutes of math every day since the start of the new year. Our latest math play fun began with counting pillows in our living room. (We have an obscene amount due to a botched couch delivery-they threw in an extra shipment of free pillows!) I quickly realized that we could sort and classify each pillow by it’s color. That led to this little gem, which we whipped up pretty quickly with a piece of paper, some dot stickers and a marker. Each dot stood for one pillow, and we sorted them and graphed them by color. This really took the idea of counting up a few notches. Not only could we find out how many pillows we have total, but we could also find out our most common color, and our least common color(s). This could be done with all sorts of things in our house, and as we become more advanced we can practice some adding strategies. Have you done any early measurement and data graphing at home? Please feel free to share! Last year when I was teaching area and perimeter, we wrote all over the floor with a dry erase marker to block off shapes. When I “tested” it on my own, I was able to wipe the marker away with my finger because the ink was still wet. However, after all the students had written all over the floor, I learned that once the ink was dry, YOU CANNOT WIPE IT AWAY with your finger. Oops. I learned from that mistake! We all learn from our mistakes daily! We learn from our mistakes in math as well. Sometimes I think the best mathematicians are the people who are the very best at analyzing their mistakes. I’ve noticed for students who struggle, it is very difficult to find their own mistakes. I let them take a long look at it, and then I pick popsicle sticks. Students always have the option to pass if they aren’t sure, but most times they spot my error! The most important part though, is to be sure that you’ve shared plenty of examples of the right way (sometimes I make a mistake that is actually correct on an anchor chart that is hanging on the wall). If they haven’t seen many examples of the right way to do it, they won’t be able to spot the mistake. My students sure to LOVE to prove me wrong! 1. Stop being scared of math! I spent a good two years being terrified of math because I was terrible at math my entire life. If you can embrace the fear right now, you can also do tips #2-10. 2. Make a lot of mistakes. 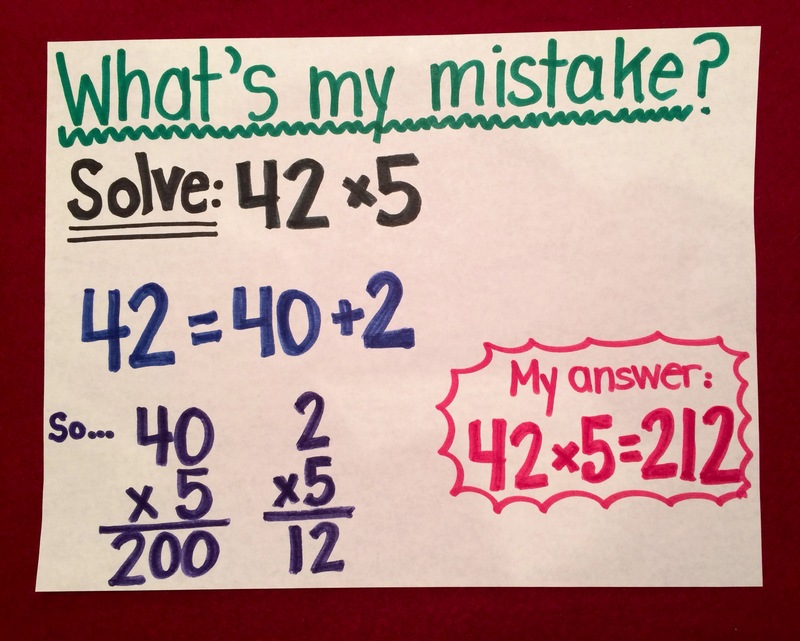 In fact, make a TON of mistakes in front of your students. They will love you for it, and it helps them see things they wouldn’t see if you always did math perfectly. 3. Allow your students to make many mistakes. Don’t grade everything they work on, give them time to practice. If they make mistakes it should be without worry of a grade so that they can analyze them. 4. 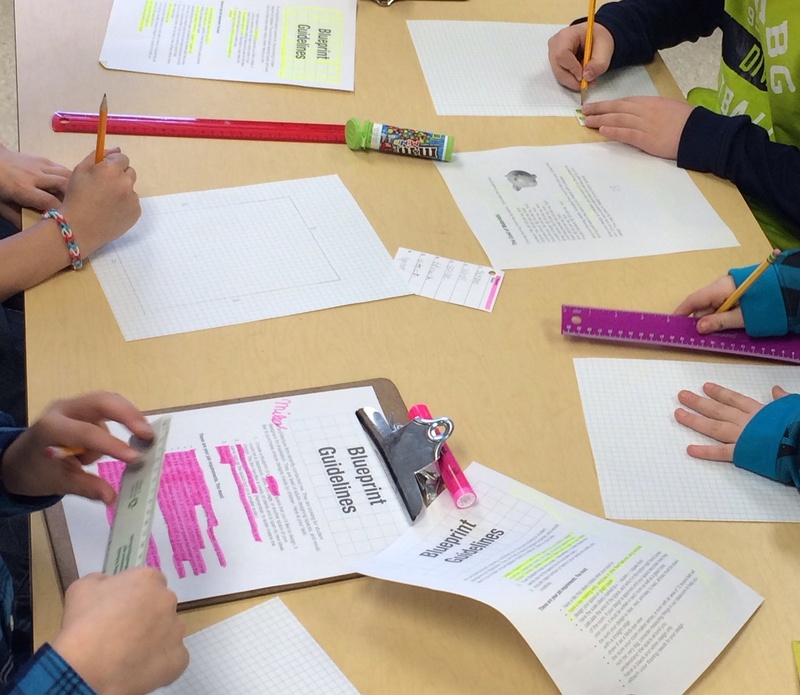 Make your students analyze their OWN work. If you correct their work, hand it back with a note that has all the right answers, they are done learning. You are the only one that did any of the learning unless they can analyze what they did wrong. 5. Get in their space. Walk around a lot and get down next to students, work with them and talk to them about their thinking. Keep them accountable with group shares and math talk. 6. Let them share. You aren’t the only one with great tricks and strategies, let the students share their thinking so that they can inspire their peers. 7. Give immediate feedback on their performance. Allow them to take home work occasionally, but encourage most of it in class where you can correct misconceptions right away. 8. Practice doesn’t have to mean a worksheet. I use worksheets from time to time, but that isn’t the only way to practice skills. Pull out the manipulatives, dry erase boards or other tools. Let them draw their thinking all over the easel paper and chalkboards. Let math be messy, and let it take on the beauty that it really is. 9. No matter what, ALWAYS connect math concepts to their world. Math does not have meaning unless they care about it, and can use it in a setting that is motivating to them. 10. Use data to drive your instruction. Using exit slips for every lesson is a very powerful way to form groups, and to figure out who needs what immediately. Good luck to all of those who are beginning a new semester or a new school year. I wish you lots of math love!